I come from a long line of rule breakers, so of course I became a lawyer. 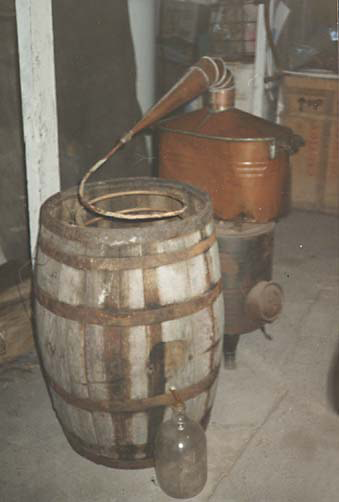 Yes, my grandfather and his brothers and sisters, in Pierz, Minnesota, in the 1920’s were known for making some of the finest moonshine in the country. More than once we heard stories about them having to hide from the Feds during prohibition. Well, they were German so it was excusable. What good German could get along without some beer or moonshine on a regular basis? They were a fun bunch even into their nineties and they actually did not hide the fact that they made moonshine during prohibition. They told their stories in an almost bragging fashion. There is only one sister left now, and she will be ninety nine soon. If you would use my great uncles and aunts as a study on longevity, you would have to conclude that rule breaking and drinking moonshine equals a long and FUN life. They told one particular story where it is said that my grandpa and great uncles, who were all in their late teens and early twenties at the time, blew out all of the windows in the house while running the still in the basement. As the story goes, my great grandma was quite angry, because they had to go to different towns and just buy one window at a time so as not to raise suspicion at any one particular mercantile store. The story in hindsight is hard to believe because everyone in Pierz, it seemed, was of German heritage and many of them were related and probably bought the moonshine from my grandpa and his brothers, so exactly who would turn them in is not known. They lived a couple of miles outside of town on the family farm running a dairy operation. The farm is still in the family and the original house is still there, but has been worked on and kept up nicely over the years. My grandpa also claimed that at one point during prohibition, two of his brothers had warrants out for their arrest and had to hide in the back woods of the family farm, until they received word from town that the Feds had left, not being able to find them. They were a big happy family with a strong devotion to the Catholic faith. They would never miss church on a Sunday or eat before communion, but they made brew in the bathtub and risked Federal prison. It is a funny contrast when you think about it. It seems in hindsight that they chose which rules had to be followed. It could not be that they simply disagreed with prohibition. I am sure there were many rules in the church and elsewhere that they did not agree with, but yet followed them. It had to be something specific about Prohibition. They clearly did not recognize the Federal Government’s ability to regulate liquor. They had to have a sense that the Federal Government had no right to make Alcohol illegal. This is an interesting concept in rural America in the 1920’s. They were farmers who raised their chickens and pigs and milked the cows, and planted and harvested their crops, and they made homemade bread and sausage and they raged against the man. I love it in hindsight. They were the original Rule breakers in the family and they passed down a sense of self confidence and the ability to question authority and question the main stream. Just because it was the law did not make it right. Through their stories they passed down the ability to think for ourselves, and to enjoy life and the pursuit of happiness. It is these qualities that are embedded not only in our fond memories of them and their stories, but in our very genes that has helped us as their grandchildren and great grandchildren to be very successful in many ways. The descendants are doctors, accountants, successful business owners, nurses, a judge, teachers and one of my most fun cousins Don Millner, became a dentist, but now owns a successful winery in Kimball Minnesota. It is interestingly named after the moonshine making family and known as the Millner Heritage Winery. It is a really fun place to visit. We went with one of our BFC’s (Best Friend Couples) a couple of years ago and had an awesome Sunday afternoon drinking wine and exchanging stories with Donny. The wine is some of the best around and he has won many awards. Family reunions on this side of the family are a full contact sport. You really have to train for it like a marathon and possibly wear ear plugs. They are loud, and in your face fun! You cannot go to this reunion without having a great time. This is a group that still drinks moonshine, just to be nostalgic and is proud of our rule breaking, outlaw heritage. The family is now spread all over the country, but we usually come back to our roots in Pierz, every few years to continue to hand down the stories that are a part of our very nature and heritage and raise glasses in honor of our grandparents and great uncles and aunts. They all taught us the simple, but important lesson of work hard and play hard and, of course the importance of family.